I had the opportunity to attend HubSpot’s INBOUND conference this week with approximately 18,999 other HubSpot fans. Now, we’re using the free marketing product too, called not-so-novelly, HubSpot Marketing Free. Why are we using it? 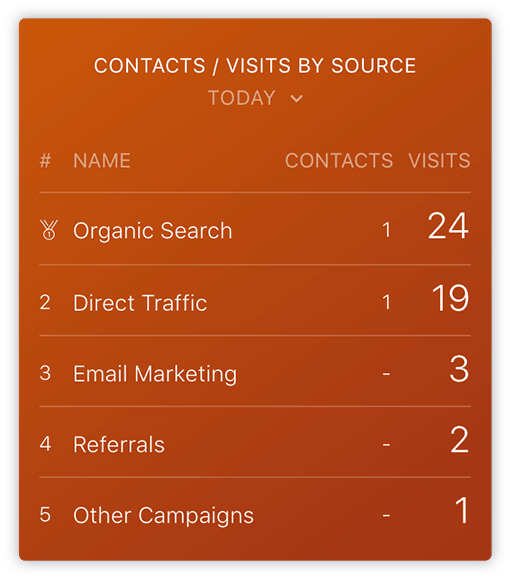 HubSpot Marketing Free (henceforth, I’ll call it HSMF) will help us grow our email list and get insights about our leads and users too. As data nerds, it also gives us some quick insights about our traffic and lead sources. All for free! How does HSMF do all that, you might ask? Let me show you. Read on to see if it makes sense for you to use it too. Step one was to set up the analytics code. Here are the instructions. If you’ve ever setup Google Analytics code on your site, it’s the same exact process. Once installed, you get two instant benefits. First, it captures contact information anytime someone fills out a form on your site and puts it into the CRM. Second, it tells us what pages those people viewed before and after they converted. We do a light amount of follow up after someone starts using the free version of Databox. With this page view information, we have a clue about a new user’s interests, so we can reach out with context. 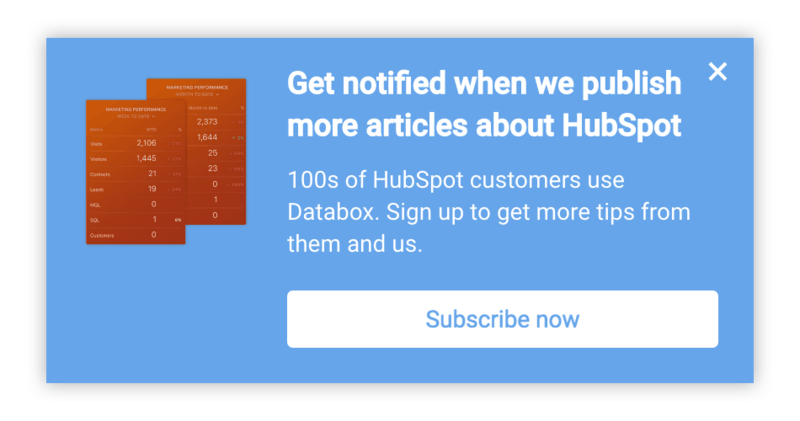 For example, we can say, “Do you need help customizing your HubSpot reports inside Databox?” if they started using our free product after reading an article we published about the HubSpot Databox integration. Like HubSpot, Databox follows a freemium model: You can start using our product for free up to certain limits. If you need more features or you need to use it more intensely, you’ll be prompted to pay. But enough about our strategy. Let me show you how we’re growing our blog subscriber list with HSMF’s Lead Flows. Lead Flows allow you to create a call to action that leads to a form that leads to a thank you page. And you can put a lead flow on any page or multiple pages of your site, all without touching any code on your site. Even for a technical team like ours, this saves a lot of time. For a non-technical marketer, this is a godsend – no more cutting and pasting code or waiting for a webmaster to do it for you. Once you click the “Subscribe” link, you’ll see a form to enter your email address. With Lead Flows, you can use slide-ins, pop-ups or drop downs. From my perspective, slide-ins and dropdowns aren’t annoying like popups, since they are positioned away from the content or appear after much of an article has been read. I find them a lot less intrusive than pop-ups, but if you really want to grab a user’s attention, HSFM offers pop-ups too. Here’s a longer explanation of when to use a slide-in, drop-down or pop-up from HubSpot’s Ari Plaut. As an important aside, the reason these Lead Flows are valuable is that they enable us to change the call to action for every article. This way, the call to action where we prompt visitors to sign up for our blog can be tailored to the article they’re reading. This should increase the number of people signing up for our email list. At Databox, we use MailChimp to send our email newsletters to our blog subscribers and product users. With HSMF, new leads automatically go into Mailchimp. It was a one step setup screen in HSMF where we entered our Mailchimp API code. HubSpot is clever to give this data to marketers, right out of the box with no real setup required. In HSMF, they embed a simple version of their more sophisticated HubSpot Sources analytics data in the HSMF dashboard. Pretty slick. While this free report in HSMF is great and much easier than trying to configure Goals in Google Analytics for the job, the canned report inside HSMF only gives you a month-to-date view of where your traffic and leads are coming from. If you want to see your data more granularly, use the free version of Databox with HubSpot Marketing Free. 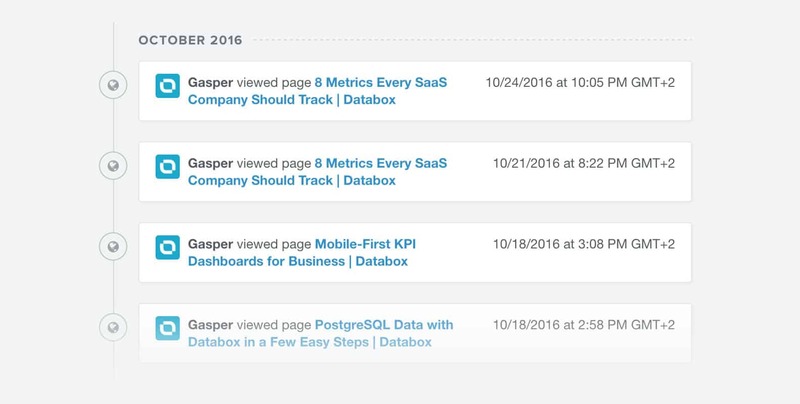 With the HubSpot Marketing + Databox integration, you can look at daily, week to date, month to date and many other time intervals. Here’s an example of what it looks like for a partial days worth of traffic and leads. In fact, there’s a whole slew of other visualizations you can get when you integrate HubSpot’s free tools with Databox. Try it here. While not free, I highly recommend you go to next year’s INBOUND conference. Not only did I learn about HubSpot’s new free marketing product, I also learned a whole lot more about their entire suite, had an opportunity to meet many amazing marketing agencies and marketers, and got more indoctrinated into the Inbound movement. At Databox, we believe that every company should do inbound marketing. It just makes sense to spend more time helping people than it does interrupting them. By offering a free software product and writing articles like this one, we know we’re helping a lot of people and some of them become our customers. The money from those customers helps us help more people. After attending the conference and meeting HubSpot customers and partners, it’s clear that HubSpot—the software and the company—have helped many companies start and scale their own inbound marketing efforts. We’re excited to be one of them. Of course, HubSpot isn’t the only software company trying to help companies implement inbound marketing. And HubSpot recognizes that. They know it’s a team sport. In fact, HubSpot had their first event for HubSpot Connect partners at INBOUND this year. HubSpot Connect is HubSpot’s partnership program for other software companies who have integrated their software with HubSpot’s. Software companies, big and small, were well represented at the Connect event and on the floor of the convention center. With the capabilities of all of these companies, a marketer has pretty much everything they need to help grow their company. And if the number of agencies who claim HubSpot helped them grow over the years is any indication, I expect they’ll help many software companies attract many new customers too. With their Connect program, their free products, their massive following and quickly growing customer count, HubSpot has cemented themselves as an important company in marketing technology and in Boston (right where we are located too). If you’re not already using HubSpot, I can’t think of a reason not to. Start with their free tools. For the price, it’s an absolutely amazing value. Thank you, HubSpot, for a great week and for great free tools.